If you liked the Gwyneth Paltrow movie Sliding Doors, you will love The Post-Birthday World. While Lionel Shriver is better known for her equally well crafted book, We Need to Talk About Kevin, I enjoyed this book more. 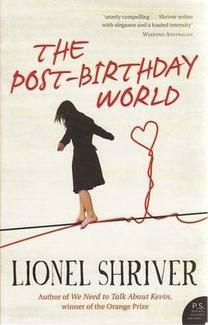 In The Post-Birthday World, Shriver places her central character, Irina, at a crossroads. She must make a split decision - remain faithful to Lawrence, her partner of 10 years, or venture into the unknown with Ramsey. Shriver creates a parallel universe in which we are able to witness the outcomes of both choices as they unfold. The Post-Birthday World explores the impact of the choices we make and how they can alter the path of our lives. It is a book that will stay with you long after the last page. When you finish it, ask yourself – what would your choice have been? Would you like to read The Post-Birthday World? Please note: I have selected these sites to give you access to low prices with free delivery. You won't pay any more if you buy this book via these links, but I will earn a small commission. If you read this book as a result of my review, please return and submit your vote in the right-hand column of the screen.